There will be available parking at the Algonac Mall Shopping Center. We kindly ask that you DO NOT park on the lawns of the surrounding homes or along the streets where designated parking is not available. Please be advised, the Algonac Police Department has asked that no one park along the streets. Use the available parking lots. The Start Lines will be located on Columbia Street, next to the Algonac Post Office. The Finish Line will be located on the boardwalk, along the St. Clair River, directly across from the Algonac Post Office and Algonac Fire Department. To view the course map, please view our Course Maps page. A water station will be located just after the 2-Mile and 4-Mile points on the 10K course, and there will be no water stations located on the 5K course. Please plan accordingly. Bathroom facilities will be available at the Start and Finish Line areas. 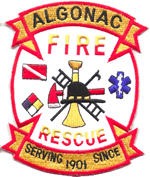 A FREE pancake breakfast, presented by the Algonac Fire Department, will be available to all participants following the race in the Algonac Fire Hall. The breakfast will include pancakes, sausage or bacon and coffee. All non-participants will be asked for a donation, with the proceeds benefiting the Algonac Fire Department.